The first novel in a YA fantasy romance series featuring “vampires with bite and girls who bite back. A witty, exhilarating and fresh take on an old tale” (Kelley Armstrong). On her sixteenth birthday, Solange Drake is going to die . . .
As the only daughter ever born to an ancient vampire dynasty, Solange’s sweet sixteen just means she will fully come into her own as an immortal. Unfortunately, it also means a lot of people both dead and undead are now watching her. Especially Kieran Black—a vengeful agent with an anti-vampire league who blames Solange’s family for his father’s death. Luckily, Solange has her human best friend, Lucy, who tries to help her have as normal a life as possible, despite her overprotective brothers and the politics of the undead realm. But when Solange is abducted by a power-hungry vampire queen, it will take all her friends—as well as the daring and dangerous Kieran—to rescue her before she loses her eternal life . . . 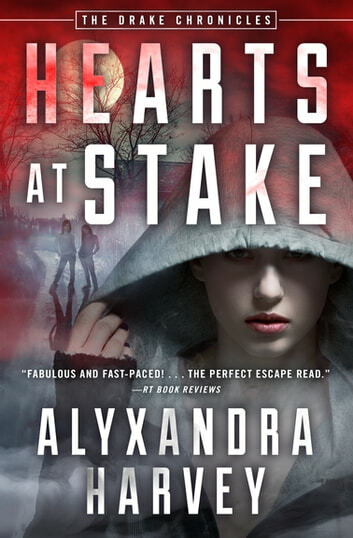 In this “action-packed” (School Library Journal) story of love, loyalty, and blood ties, Alyxandra Harvey kicks off a saga of thrills with a nail-biter—and a neck-biter—that will have readers eager to devour the rest of the series. 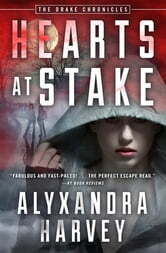 Hearts at Stake is the 1st book in the Drake Chronicles, which also includes Blood Feud and Out for Blood. I love Alyxandra Harvey's writing. The story was fast paced and extremely entertaining. Also I think Lucy is my spirit animal.